My first Samba! | Surfer Grrrls Brazil! One thing I told myself when I came to Brazil was to simplify my life. Focus on my project, Surfer Grrrls Brazil, don’t plan too much in one day, and enjoy the things that I am doing in the moments that I do them. But in the last few days, I have been running from one event to the next a little bit like a chicken with my head cut off. I was noticing that the more I ran from one thing to the other, the less I actually enjoyed the things I was running to. It was time to slow down and just give myself a little time to reflect and enjoy and write. BUT the problem was, there was one more thing happening the other night that I really didn’t want to miss. (you see how my thinking goes…) A samba party at Lagaoa Conceincao. Lagoa is the beautiful, part alternative artsy, part tourist party resort-y, town that lies half way between the main city and the coast. Its nestled amidst mountains, on the banks of a GORGEOUS huge lake that is pinched in two by a little isthmus of land. On this strip lies a row of restaurants and bars where you can enjoy cold refreshments on sunkissed verandas and gaze at the sailboats and kite surfers zipping around on the water just a few feet away. 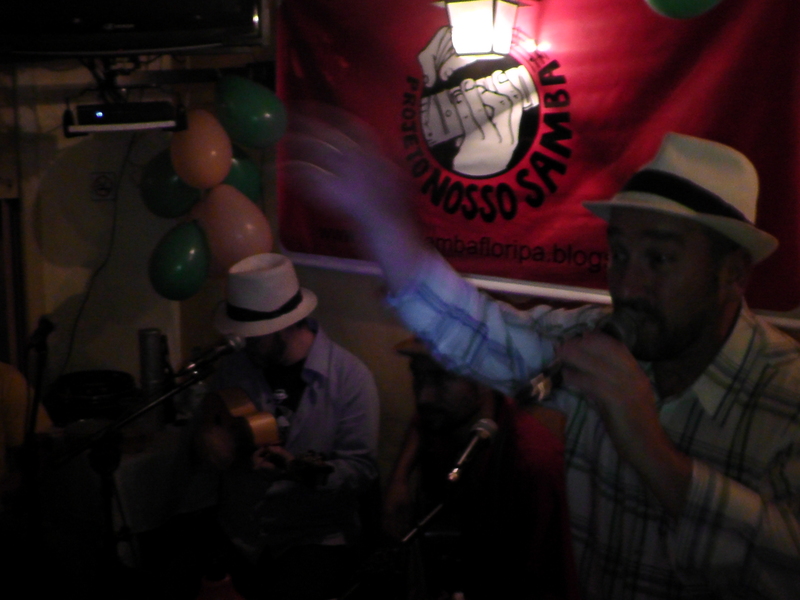 Since coming to Brazil, I’d really wanted to hear samba, the lilting music that is so quintessentially Brazilian, and I was also getting concerned about my lack of involvement in local night life. I had always dreamed that Brazilian nights were filled with parties and music, but most of the surfers I had been hanging with went to sleep early, and my beloved Brazilian family is not much interested in leaving the house after 8pm. With the exception of one lovely night listening to an African-fusion-jazz band, I spent most of my nights at home. Part of this also has to do with my my car-lessness and the location of my living quarters far from the center of music and night life. Buses are painfully infrequent after 8pm, and getting anywhere becomes a major project. So I was extremely determined to go to this samba event tonight, even though all signs suggested that I should work on my goal of simplifying my life, and just stay home. I had been working for most of the day on a variety of neglected tasks, but was still feeling overwhelmed and not yet caught up. I managed to make it to the beach for a quick yet glorious sunset surf session and a little reprieve. But afterwards, my own poor planning led to me not having any food at home for dinner and a series of internet glitches caused my evening work session to be much more frustrating then productive. Pretty soon, it was 10 pm, I still hadn’t eaten dinner, and I was a long and complicated bus ride away from the samba party, with no clear way of getting back home when it ended. But for some reason, I could not let go of the idea of going to this party. So off I went, for the 40 minute trek to the bus stop, starving, exhausted, and annoyed by my own stubborness. An hour and a half later, I arrive at the party. It is at a bar right across from the water, but the bar is more like a house with a big veranda and a front yard. There are people milling about everywhere on the lawn, and a happy party atmosphere. It looks fun, but there is no music, and I didn’t know anyone, so I am gonna have to work on being social or brave with no other tool than my middling Portuguese. I head inside the house/bar, hoping that it might contain a scrap of food for me to eat. But just as I arrive, the kitchen closes. I may die here at this party because my stomach is starting to digest itself. But wait! I see someone I know, a dude from the music classes I have been going to. I am distracted from my hunger by the hope of someone to talk to. Upon seeing my distress at the kitchen being closed, He offers me a bite of his potato pastry and talks to me so I feel like less of a loser just standing around. And then things start to look better, because I realize that this inside area is where the band plays. Their instruments are all set up, they are just taking a break and now they are coming back. Several middle aged to older men wearing caps and fedora-esque hats take seats at stools and chairs in the corner. There are a couple guitars, a little mini guitar, and a host of percussion instruments – including a pandeiro (my favorite!) – the little frame drum with jingles on the side, a scrapey thing, a couple of the deep bass drums or surdos, the agogo (double cow bells), and an awesome instrument called a cuica which looks like a drum and sounds like a laughing monkey and is played by rubbing a wet cloth on the inside. There’s even a trombone waiting at the ready! I am getting very excited for someone to pick that up and start playing. There really is very little separation between where the musicians are sitting and the rest of the room, and many of the copious drums spill out into the area where the people are milling around to listen and dance. And then the guitars start strumming. And then the pandeiro and bigger drums jump in, in perfect rhythmic counterpoint, and then I hear how it all fits together, the perfect polyrhythmic swing of samba, and it is BEAUTIFUL. and suddenly the attention of the room has shifted to the musicians, and everyone is dancing. And a voluptuous dark haired matron begins to sing, and I realize that I have been transported directly into all my Brazilian dreams. The scene that I’d always imagined while listening to traditional samba cds , the crowded bar, the clink of glasses in the background, the dim golden light which makes everyone look rosy and flushed, the table of grandparents next to the musicians embracing and swaying as they sing along, and the music just filling the space – so casually but so completely, while people dance and smile. I forget my hunger in my newfound bliss, and all I can do is smile and dance. The musicians are literally right in front of me, and I feel like the lady is singing right to me. All around me folks are doing the very tricky to master, samba dance, where you move your hips and your feet really fast. My Brazilian friend Marisa once explained to me, that its easier if you pretend you are crushing an invisible cockroach with your heel . Behind us couples are dancing elegantly in the impossibly crowded space. Pretty soon someone grabs me to dance, and I explain that I don’t know how to do Samba, but my dance partner, who I soon realize is one of the bar’s “designated dancer” sees no problem with this fact, and starts leading me around in a dance requiring pretty intricate hip wiggling. Thank god for all the Forro dancing I’d been doing in SF, because I was able to hang on barely by my fingernails. I screwed up most of the complicated steps, but my Brazilian friend was forgiving and kindly told me that the important thing was the I had the ginga down. The ginga is the “swing” or feel, so if I’m OK in that regard, perhaps theres hope for me learning the extra stuff. The evening continues on in a whirl of joy. Every few songs, the singers trade off and new singers join the musicians, some seem to be old regulars and some are unexpected guests. Everyone in the bar knows the words to the songs, and sings along, sometimes closing their eyes and crooning in plaintive bliss. The party, perhaps unsurprisingly, does not end at 1 as written, but continues at least an hour later. By the time its over, I have made new friends who can give me a ride home, I have received a sizeable education in samba dancing, and my face hurts from smiling pretty much non stop since the music started. 2:30 am, back at home, sweaty, sore footed, and still abuzz from my evening, I laugh because the lesson about simplifying my life is going to have to wait. Why do I force myself out the door at 10:30 pm when I am exhausted and have not had any dinner to take public transportation to a town on the other side of a mountain?? Because life is AMAZING!!!! And you have to drink up as much of it as you can while you have the chance! I cook myself a 4 egg cheese omelette, scarf it down, and go to bed. Thank you Brazil for my best night here so far! My heart flutters for you and your adventures!! Thanks for taking me with you and letting me experience Brazil vicariously. Keep up the good work! !